A biting wind sweeps down the rainy street, stirring fallen leaves and unfurling umbrellas. Still, people trekked on, hands deep in their pockets as they journey to the front doors of the Humber College Art Commons. Inside the Lakeshore campus area, it is crowded with Game Programming and 3D Animation students eager to showcase their projects to industry workers, peers and family. The Humber College 3D Animation and Game Programming Showcase was the evening of March 27, but the future of the students is as bright as it is infinite, thanks to the event’s network opportunities, the projects themselves and the support of some of the school’s most dedicated professors. One such student is Tuyet Nhi Neenee Ngo, who single-handedly made a game engine from scratch. She used tutorials and what she had learned in class to do it — including the lessons in coding and the help of her professors — to be crucial. “There’s just so many lessons that we learned here, but I think one of the important ones, in terms of coding, it’s just like being neat, organized and just making sure things are optimized, because once you have that done, you feel so relieved, and things are just so much easier to code,” Ngo said. “Some teachers actually stay after hours, or they stay at a certain day and they say, “just come in, I’ll help you with whatever you need.” They’ve just been so helpful,” she said, describing professors Scott Fielder and Umer Noor. What inspired Ngo was her own thoughts on games when she was growing up. She had always wanted to understand how game mechanics worked and wondered how she could code them herself. 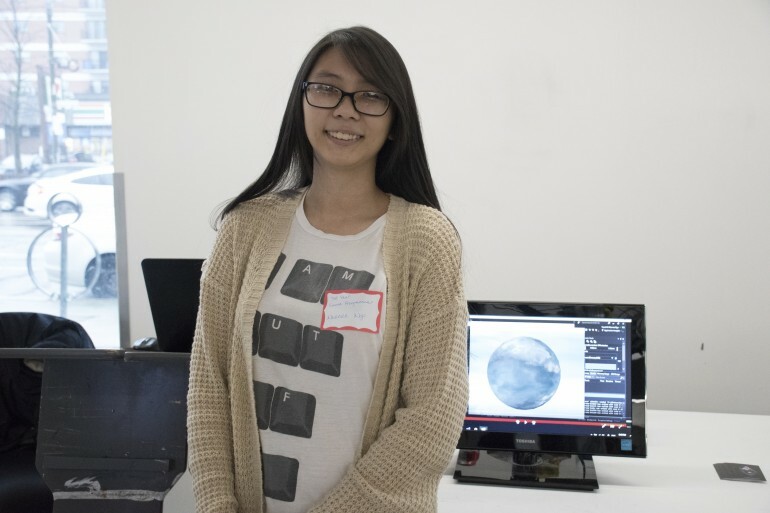 “So coming into this program, I learned how to do it, and it’s just my dream to actually make my own sorta little game — it’s just getting closer and closer,” she said. Ivan Boyko is another student who worked on a game engine. At the urging of his program coordinator, he and his team then built a game to showcase the best elements of it. Their game was inspired by the Pro-Bending sport from The Legend of Korra television series. It featured teams of two who fight each other in a fast-paced and action-packed arena in order to stay inside the ring. The making of the game was difficult at first, because of networking issues and team ambition. They wanted to build a more complicated game in order to showcase their vision. In the end, they were able to make that vision come true with the help of Humber faculty and the students themselves. 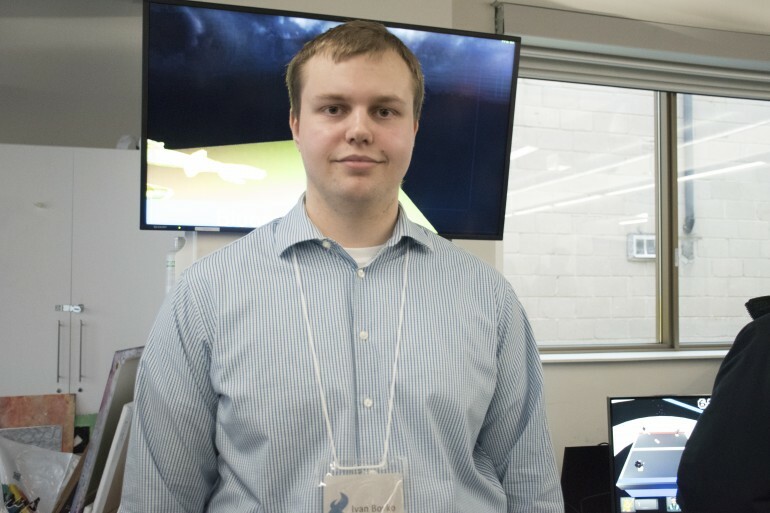 “Humber was kind enough to hook us up with people in the Arts and Animation program, as well as the Radio Broadcasting program, who did a lot of models for our game, textures, and audio assets,” Boyko said. He will continue on with Game Programming, as well as pursue the long-term goal of becoming a team lead as a technical director. Ambition also found its way to the world of virtual reality, as Kai Ahmed and his team showcased their game called Tsujigiri. Visitors roleplayed as a vengeful spirit in animated armour who enacted revenge against others with weapons and bare fists. “We really wanted to distill the feeling of battle, or like that thrill in battle to its most purest form,” Ahmed said. Like Boyko, Ahmed and his team experienced difficulty with networking. “It was really difficult to get two different games connected together through the network, and that took a lot of time and effort,” Ahmed said. The team figured it out, in the end, and it was thanks to their professors. “We don’t have computers that can actually run this hardware, so Humber provided all this hardware for us for free and gave us a space to work and the time to work. It was great. Without that, we wouldn’t be able to complete the project at all,” Ahmed said. Game programming and 3D artwork goes beyond infinity in the literal sense in the case of Jessica Kramarczyk. She created Laser Dogs, a 3D shooter game where visitors controlled dog-themed spaceships, collecting floating bones and dodging enemy laser beams. “The most challenging part was time management and group work, ’cause I lost my entire group,” Kramarczyk said. Although she felt alone in deep space due to her group falling apart in terms of leaving the program and the project, Kramarczyk was able to complete the game with Humber faculty by her side. “Humber helped me, because my teacher, Chris Alexander, he encouraged me just to go forward,” she said. Storyboard artists found a home at the showcase among the games and engines, as many good games comes with an even greater story. 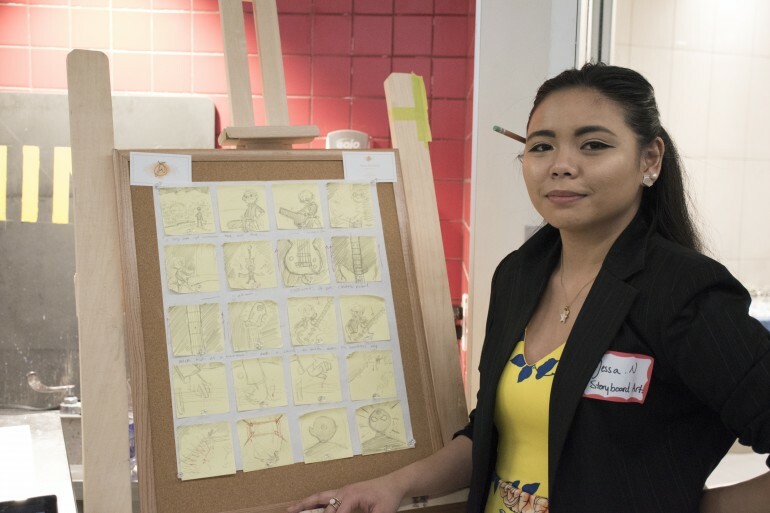 Jessa Naranjo is a storyboard artist who is currently working with CBC Kids, and she expressed her creativity by giving everyday occurrences an extraordinary spin. She showed visitors her sketchbook, where a girl was trying to get a job as a waitress in order to get by in journalism. Naranjo’s work also told the story of a young boy travelling on public transit. Hungry, the boy started to eat a cookie, which a starving pigeon attacked him for immediately. The story was inspired by her own experience in public transit about a month ago, where a pigeon got stuck inside the train. Corey Avery, the Humber professor who presented the showcase, could not be more proud of his students. “For the students, it’s always exciting, and often a little nerve wracking, to show their work to someone other than instructors or their peers,” Avery said. “Family members often look forward to convocation to see their loved ones cross the stage and receive their diploma. Over the next few weeks, students will get to participate in other events to showcase their hard work. “Level Up, which is a showcase of games from students all over Ontario, is coming up in April. Many students from Game Programming participate in that. The animation students have TAAFI (Toronto Animation Arts Festival International) to look forward to,” Avery said. “They always host a job fair that students look forward to as an opportunity to display their talent, and hopefully land their first job,” he said.